The weather right now is scorching hot, every where, even back home in the UK. Living in Ibiza I am used to the warm weather, but even here, some days have just been outrageously hot. 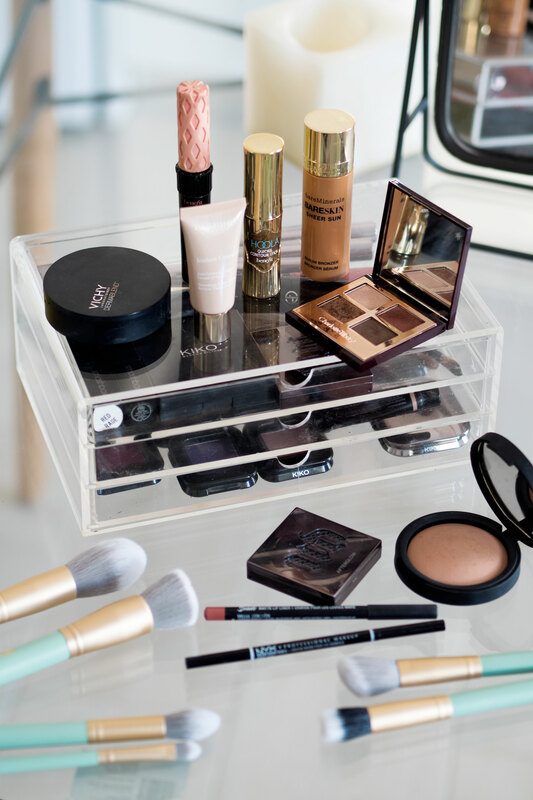 One question I get asked a lot is how I get my make-up to stay put all day long? Being a make-up artist helps, I obviously know how to apply make-up properly, so I thought I would share one of my go-to Summer make-up routines, particularly when the weather is extra hot. Hello Global Heatwave. Okay, so I never ever wear make-up to the beach, let’s just get that out of the way first of all. However, I will usually wear make-up if I am going to a pool party or having lunch at a beach club here in Ibiza. However or whenever you wear make-up, if you are struggling from stopping it sliding off in this heat, then hopefully you can take away some helpful tips from my post today. We all are going to get a little bit sweaty and sticky in this heat, and the last thing your skin wants to do is to suffocate under layers of foundation. Regardless of your skin type, the best thing for you and your skin, is to wear a minimal, light base. I don’t even wear a primer to be honest, as I just try to avoid putting a lot on my skin. If you are someone who needs more coverage, then do apply primer to the areas that you want concealing – it will definitely make it last longer. I will literally wear a little bit of concealer, and maybe a touch of stick foundation on areas that cry for more coverage. My favourite concealer for everything is Clarins Instant Concealer. I use this under my eyes for an instant brightening effect. You may feel like you want to go powder crazy to control your shine or sweat in this heat, but try to avoid adding layer after layer of powder. When you first apply your make-up, buff in a little bit of a powder foundation. Preferably use a product that helps to absorb excess oil, I really like the Vichy Dermablend Foundation powder. If you do find yourself getting shiny and sticky, I really would recommend using blotting paper before reapplying any make-up. This way you avoid getting patchy and your make-up looking caked on. Remember, light, light layers. Let your skin breathe in the heat. 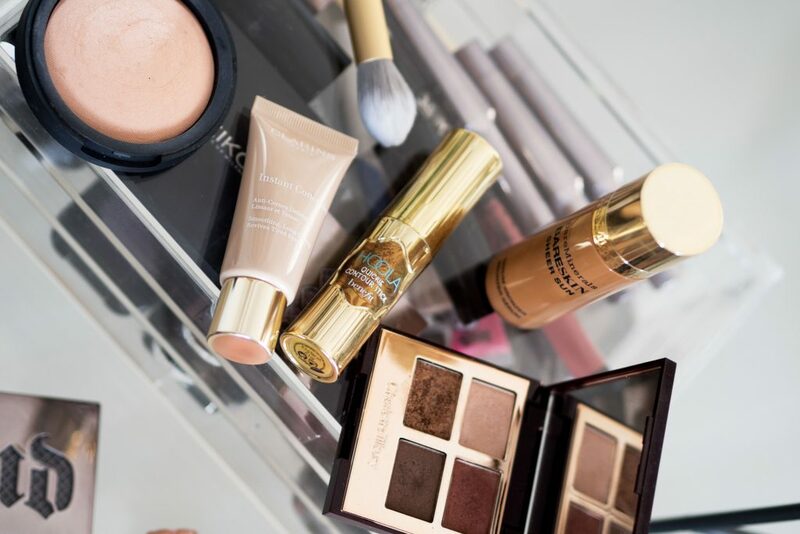 Everyone loves to look sunkissed this time of year, so go for it with your bronzer. I tend to sweep bronzer in a 3 way action around my temple, cheek and jawline, and then sweep some down the centre of my nose. I really like the Inika Bronzing Powder at the moment. All of their make-up is vegan and cruelty free. For quickness, I love the Hoola Bronzer contour stick. I can literally apply this directly from the product and just use my fingers to blend it out. Another really nice bronzing product is the Bareminerals Bareskin Sheer Sun. This is a super lightweight serum which you can blend into the skin, giving you an instant radiant glow. I love this stuff. I tend to use golds and copper tones. Using my ring finger, I added a light shimmery shade all over my lid, and then with a golden brown, or even my bronzer, I just blend through the crease. Charlotte Tilbury has a great selection of eyeshadows, and I am still loving her infamous Dolce Vita palette. If I had nice dark lashes I would probably avoid mascara altogether, as I hate wearing it when it is hot, but as I am so fair, I just added my Benefit Cosmetics Roller Lash mascara. Most of these products you can just use your fingers for application – something I would not normally suggest as I love my brushes so much – but when you are on holiday or out and about, you don’t really want to be worrying about brushes in the heat. 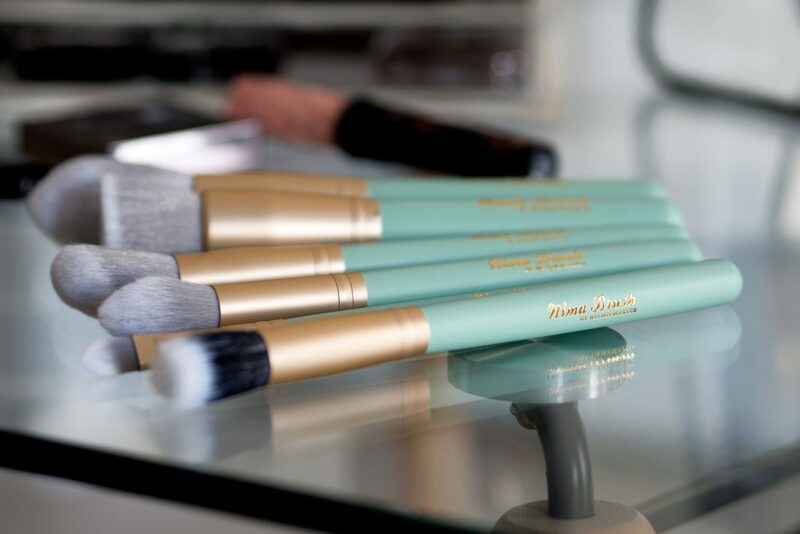 I must say though, I am loving my new Nima Brush make-up brushes. They are stunning and super soft. These particular ones photographed are vegan, and of course synthetic, but a special technology within the hair fibre mimics the fibres in animal hair. I will talk about these in more detail in an upcoming post, but yes, they are great. Of course, I would not be me without my brows. I love the NYX brow pencils with a coat of my usual Benefit Cosmetics Gimme Brow over the top, and just a little bit of lip liner and lip balm to finish it off. No need for any form of highlighter anywhere as your skin will no doubt give off a natural glow. Super light, super natural and long lasting in this heat. P.S I love my new ear rings, very kindly sent to me by Sacet. These are the Rose Gold Luija Ear climbers and they are so cute. Check out their website as they have some beautiful pieces!